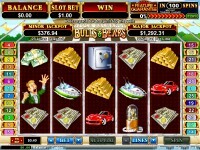 Bulls and Bears is a new online slot, created by RealTime Gaming (RTG). This new slot features 25 paylines, wild symbols, a free spins feature, and the Feature Guarantee option that is found on some RTG slots. 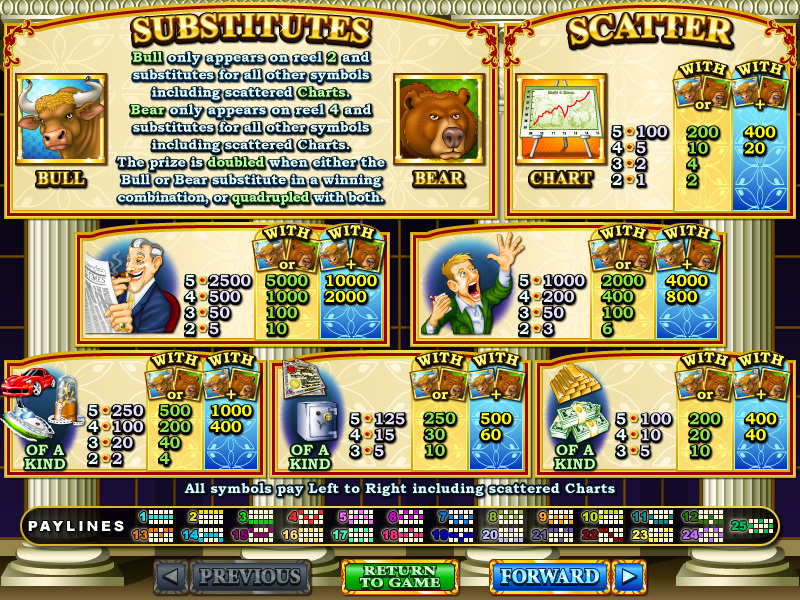 As with many online video slots, Bulls and Bears does make use of a wild symbol. To make things even better, there are actually two wild symbols used in the game. The first is the Bull symbol and this will only appear on the second reel. The other wild is the Bear symbol which will show up on the fourth reel. Both of these wilds substitute for all other symbols, with the exception of the scatter. If either wild symbol is used to complete a winning combination, the amount of the payout will be double the normal amount. If players can create a combination using both wild symbols, they will be rewarded with a win that is quadruple the normal payout. The scatter icon is the Scattered Charts symbol. This can appear in any position on the reels and will award a scatter pay when two or more are on the reels at the same time. In addition, if players can get three or more symbols, they will trigger the Free Spins Feature. This feature will award 5, 7 or 15 free spins, depending on the number of scatter symbols that appear. This free spin feature offers a unique twist. 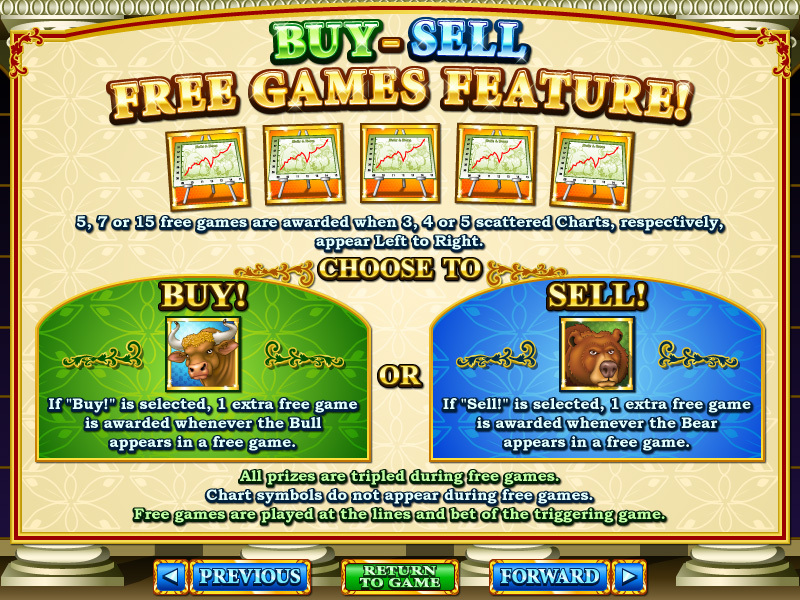 When the free games begin, players will select either the Buy or Sell symbol. Each time the selected symbol appears during the bonus, players will earn one additional free spin. During this round, all of the payouts will be tripled. Play it now at Lucky Red Casino! 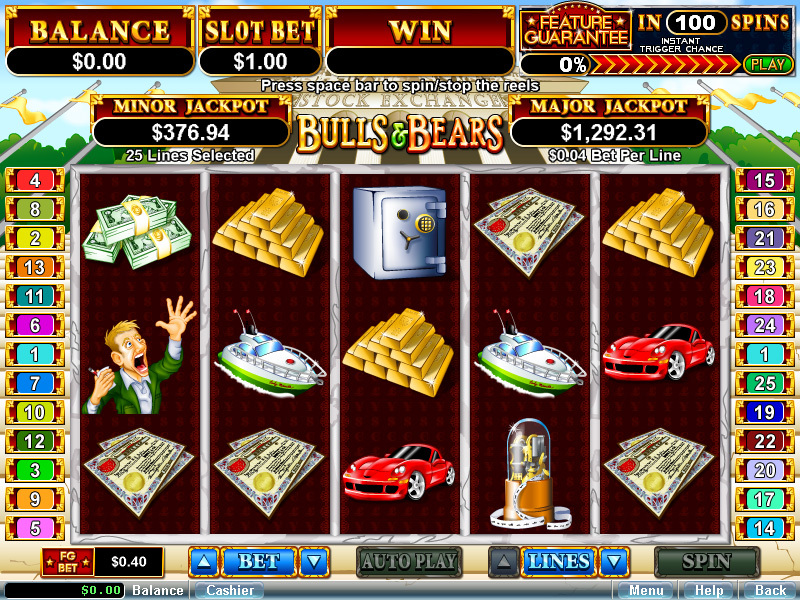 Since all players should be rewarded while playing video slots, Bulls and Bears offers a Feature Guarantee. This feature will guarantee that players win free games within a set number of spins. In order to use this feature, players must be netting 10x their current bet on each payline. Players will see a meter at the side of the screen that is set at 100. This means that is after 100 spins, the player does not trigger the free spin round, they will automatically enter the bonus round even without getting the right symbols. Once the free spin round has been triggered, either by getting the required symbols or using the guarantee feature, the meter will be reset to 100. Bulls and Bears also offers two progressive jackpots that are randomly awarded. Players will not have to get any particular winning combination to receive the Major or Minor progressive. Instead, the jackpot will be awarded at random, meaning players will have a chance to win the top payouts after each and every spin on the game. 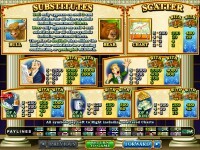 You can find the new Bulls and Bears video slot at these RTG Casinos.